The day starts with the managers' briefing. They address us four times a day at the beginning of every shift. They sit at the front of the room where we can all see them and they can see all of us. They inform us of our hourly sales rate, how it is not high enough, who made the biggest sales, what the new target rate is and what sales-related game we are going to play to boost morale. What would Jeremy Bentham say about this modern panopticon? The unfolding spectacle would be funny if so many people didn't partake in and enjoy it. It feels cartoonish, like a gimmicky Wolf of Wall Street where 30 Jordan Belforts compete to be the top salesperson. Instead of Wall Street glitz, the fortune we compete for is made by selling raffle tickets for charities. Their briefings sound like the worn-out scripts they provide us with to make sales. Sincerity is the chief sacrifice of an artificial environment. Nothing burns with honesty and everything feels staged. We are trained to build rapport, trained where to pause for effect, trained when to switch tone to inspire compassion for the cause. We are trained to game psychology for sales. So, too, do the managers build rapport, pause and switch tone in their briefings. What they try to sell is the self-belief that we can conquer a shift. It is hard to believe them when they employ techniques they have taught you. I hate feeling I am being sold something. Call centres suspend reality. The world shrinks to the size of the computer in front of you. Partitions separate you from everyone else. You are confined to this world. Every 15 minutes an automated message detailing your sales rank in relation to everyone else blinks onto the screen. You are constantly monitored, constantly pushed to compete. Eventually you forget you are being watched, like those prisoners in Brentham's panopticon. What was once delivered by a computer becomes self-reflexive. You monitor yourself, comparing yourself to everyone else. This insidious process moulds new salespeople. "My voice carries across Australia from Sydney to raise money for the country's largest charities. This is ostensibly ethical. The corrosive effect of false sincerity eats the moral sanctity of helping charities." Technology has developed so the combination of an internet connection, computer codes and telephone lines combine to compress time and space. Anyone can be called at any time. Vast geographic distances are meaningless when someone has a telephone in their pocket. My voice carries across Australia from Sydney to raise money for the country's largest charities. This is ostensibly ethical. The corrosive effect of false sincerity eats the moral sanctity of helping charities, creating a dilemma. Is it ethical that businesses raise money for charities? Charities lack the infrastructure required to raise funds on the scale businesses can, and so businesses — which possess the expertise charities lack — are given the job of raising money on their behalf. I try to convince myself of this necessity by repeating a series of naïve questions. But I am left with the certainty that businesses sacrifice the integrity of charities by focusing on competition and profits. Everything turns into a sale. We call centre employees make millions per annum for several charities. Fifty per cent of this is appropriated as company revenue. The result: the charity receives a few million dollars. Does this not redeem businesses, validating their sales techniques and philosophy? Despite this reasoning, the feeling that the charity is a tool to make money for businesses — rather than the other way round — remains. Maybe it is the emptiness in the eyes of those who have worked there long enough or how brazenly they discuss their sales numbers. Their actions and their outlook reveal how little they care for the charities and how much they care about competing to make large sales. My calls are scripted, yet people do not lead scripted lives. Calling strangers reveals the joys and pains of everyday life - unemployment, unexpected death, losing pets, medical uncertainties, stress springing from life's innumerable demands. So too is there the joy of recent marriage, birth, school graduation and retirement. But what stays with me is not people's joy. Joy is rare, like white clouds dotting the bleak storm front gathering on Australia's collective psyche. It is hard to find verve when you have spent 40 minutes talking to an old lady about the pains of rebuilding her life after fleeing a war-torn country, or after spending 15 minutes making sure a recently unemployed labourer will not take his life. It is hard to feel chipper about making sales after your pitch causes an emotional breakdown in someone whose child passed away from drug abuse. The emotional labour required to remain mentally well during shifts is extreme. 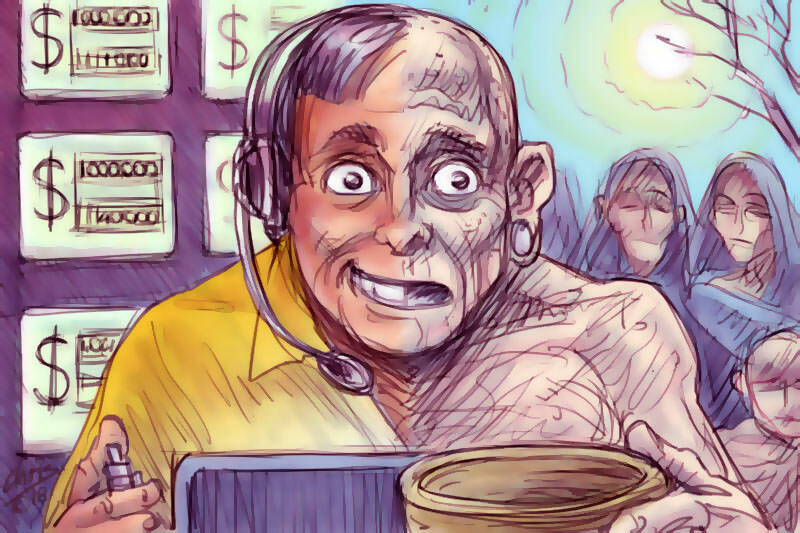 Call centres must address their underlying philosophy of money-making and orient themselves to be more in line with the values of the charities they ostensibly serve. After eight hours of abrasive calling, I slip into the quiet world outside, worried about tomorrow. Luke Timp is a graduate of International and Global Studies at Sydney University and is currently studying law at ANU. He no longer works at a call centre. I am sure I'm not the only reader disturbed by the dehumanising treadmill described by Luke as the call centre raising money for charities. It is in direct conflict with the very human desire to contribute to charities who work to alleviate poverty, illness, disability, restriction on liberty, or any of the wide range of services charities offer. I never give in response to a call centre request. There is an alternative way to give. Over the years, I have observed a wide range of charities, sufficiently to be confident that the number I choose to support are genuine, and effective in the support they give. Twice per year, I make donations to those charities and I refuse to give in response to a call requesting either a one-off donation, or the more frequent request for a regular monthly contribution. No doubt some banks here and there gain a fee for the money transfers I make, but there is no other "business take" from what I choose to give. Administration and salary costs within a charity are unavoidable, but maintaining a call centre can be avoided. Hera, Hear !! Ian Fraser. My own view is the same as Ian Fraser's of 13 April. For a long time I believed that the 'phone calls came from a charity. It did not occur to me that they were outsourced to business. On quite a few occasions I wanted to donate, but not over the 'phone, so I asked to be sent something in the mail to which I would respond with a cheque. They never sent anything. There was obviously no commitment to the charitable cause the pretended to represent. Like Ian Fraser, I donate twice a year. This in response to some of the appeals received by mail. Agree Agree! I am sick of the phone calls we get from these so called charities . I feel so very sorry for the call centre people who must be under quite a lot of pressure to reach quotas. I am also not impressed by the huge sums of money spent on dehumanising ads of destitute kids in third world countries, who in my view are being exploited in order to elicit our pity. I am sure there are much better and ethical ways to bring these people out of poverty. Charities, especially Catholic ones, are doing it tough. Government grants don't come, fewer people attend churches and there is an overkill of requests. I get at least one per week. Meanwhile, the disparity between even moderate comfort and misery (no longer wealth and poverty) grows larger. Choosing whom to support really requires involvement so we know whether or not they are ridgy didge. Luke's experience underlines our need to put these call centres out of business. They are like the organisations that sell raffle tickets in shopping centres. The big winners are the companies that exploit young people (paying them only on commission) and the charities whose good name they are cynically using. Supporting a charity is now like choosing a dentist. We should give usable donations to those who are efficient, transparent and decent. An elegantly crafted piece by a man who maintains a sound moral compass, astute observational skills and facility with language. His message is compelling because his values appear to be out of step with those of his former employer. I thank him for sharing his insights. There was an article in the Sydney Uni syudent newspaper Honi Soit about this (I can't get my hands on it right now but I will try to find a link later and post it). Anyway it was written by a student who worked for one of these call centres but left because of what she perceived as unethical behaviour. When a penniless student (no doubt saving up to pay off her eventual HECS debt) leaves a job, you know something is wrong about the job. I can relate to Luke's angst and moral dilemma through direct experience as a trainee CSR (customer service represent/tax agent) for the ATO. And I would argue that moral dilemma of using a competitive/sales/brevity of call model to rank my performance as an ATO CSR is even harder to grapple with than it would have been if I'd been rausing revenue or a charity - because taxpayers are clients of the ATO's call centres - not voluntary donors. Yes, the ATO outsources its tax agent/call centre services to private/publicly listed data/tech companies whose only motivation is profit, and to get you off the phone as quickly as possible to deal with the next call. even if they haven't satisfied your call request. And this appears exactly the service model the Fed Gov has announced today with it's decision to outsource Centrelink call centre services to private companies. Speak to any current of former employee of a privately-run call centre, and they will say "God, help us!" They'll be barely out of high school, mostly university students, earning $21 an hour to work from 8am till 4.30pm in the equivalent of an office sweatshop. Thank you, Luke - and indeed all those who have posted to date - for demonstrating that there's still a powerful and prophetic protest in our community. This protest against the conversion of our human polity to a mechanical one, our hearts of flesh to hearts of stone, is essential if we are to remain human and live a truly Eucharistic life. I worked for several months for Centrelink. Like Aurelius, I shudder to think of the results of outsourcing its call centre. Human beings can't outsource the spirit that animates the body. (Fuzzy, sorry, but I truly am horrified)!